What is the Deepest Swim Spa on the Market? Posted on August 24, 2017 , in Swim Spas. When you want a truly spacious swim, having a swim spa that is deep enough to complete a full stroke is essential. Deep water is also important when you want to get the most out of water fitness activities. Below you’ll find out about the dimensions of the deepest swim spas, how much space they require, and get top recommendations for choosing the right depth for you. Because swim spas are very specifically engineered, they tend to have the same depth on average, which can range anywhere between 4 and 5 feet. Engineers and designers agree that this depth allows users to swim comfortably while ensuring that their swim spas are properly and safely designed. If you want a more spacious swim, it will be hard to find a swim spa with a depth beyond this range. Instead, choose a model with a larger depth and height. The smallest swim spas available are designed for aquatic therapy and are between 10 and 11 feet in length. Muscle relaxation, water walking, and massage features can be used to treat chronic pain, arthritis, and muscle injuries. These swim spas are similar to a hot tub and are usually set to a temperature of approximately 90 degrees. Fitness swim spas, which allow for comfortable swimming and feature an adjustable current you can tailor to your fitness goals, are usually between 12 and 16 feet long. They also have hydrotherapy jets so you can reap the benefits of hot tub massage features. You can also add accessories like treadmills and rowing machines. The depth of the water in these models is designed to enhance your fitness activities. In addition, they give you plenty of space for guests and playtime with the kids. When you want an extremely comfortable swim, a 17 or 18 foot swim spa is a good choice. Designed for the serious athlete, you’ll experience a smooth current, increased energy efficiency, and options to add sound systems, Wi-Fi, and other features. 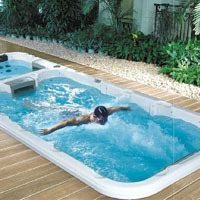 There are also even larger swim spas, which feature dual-temperature areas and are between 19 and 21 feet. Not only do these swim spas have large swimming lanes, but they also have a separate hot tub area with enough room for four to six people. Because the depth of most swim spas is usually between 4 and 5 feet, you should focus on the other dimensions, features, and maintenance options to help you make your decision. Download our buyer’s guide to find out about our wide variety of swim spa sizes.